The Grammy Award for Best Contemporary Folk Album was awarded from 1987 to 2011. Until 1993 the award was known as the Grammy Award for Best Contemporary Folk Recording. In 2007, this category was renamed Best Contemporary Folk/Americana Album. As of 2010 the category was split into two categories; Best Contemporary Folk Album and Best Americana Album. The Grammy Award for Best Folk Album is an award presented at the Grammy Awards, a ceremony that was established in 1958 and originally called the Gramophone Awards, to recording artists for releasing albums in the folk genre. Honors in several categories are presented at the ceremony annually by the National Academy of Recording Arts and Sciences of the United States to "honor artistic achievement, technical proficiency and overall excellence in the recording industry, without regard to album sales or chart position". The Grammy Award for Best Traditional Blues Album was awarded from 1983 to 2011 and from 2017 onwards. Until 1992 the award was known as Best Traditional Blues Performance and was twice awarded to individual tracks rather than albums. The Grammy Award for Best Contemporary Blues Album was awarded from 1988 to 2011 and from 2017 onwards. Until 1992 the award was known as Best Contemporary Blues Performance and in 1989 was awarded to a song rather than to an album. The Grammy Award for Best Native American Music Album was an award presented at the Grammy Awards, a ceremony that was established in 1958 and originally called the Gramophone Awards, to recording artists for quality albums in the Native American music genre. Honors in several categories are presented at the ceremony annually by the National Academy of Recording Arts and Sciences of the United States to "honor artistic achievement, technical proficiency and overall excellence in the recording industry, without regard to album sales or chart position". The Grammy Award for Best Soul Gospel Performance, Male or Female was an award presented at the 32nd Annual Grammy Awards in 1990 for quality soul gospel performances. 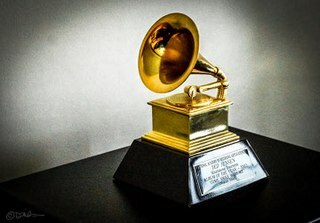 The Grammy Awards, an annual ceremony that was established in 1958, and originally called the Gramophone Awards, are presented by the National Academy of Recording Arts and Sciences of the United States to: "honor artistic achievement, technical proficiency and overall excellence in the recording industry, without regard to album sales or chart position". The Grammy Award for Best R&B Album is an honor presented at the Grammy Awards, a ceremony that was established in 1958 and originally called the Gramophone Awards, to recording artists for quality works on albums in the R&B music genre. Honors in several categories are presented at the ceremony annually by The Recording Academy of the United States to "honor artistic achievement, technical proficiency and overall excellence in the recording industry, without regard to album sales or chart position". The Latin Grammy Award for Best Folk Album is an honor presented annually at the Latin Grammy Awards, a ceremony that recognizes excellence and creates a wider awareness of cultural diversity and contributions of Latin recording artists in the United States and internationally. The award goes to solo artists, duos, or groups for releasing vocal or instrumental albums containing at least 51% of new recordings. The Grammy Award for Best Americana Album is an honor presented to recording artists for quality albums in the Americana music genre at the Grammy Awards, a ceremony that was established in 1958 and originally called the Gramophone Awards. Honors in several categories are presented at the ceremony annually by the National Academy of Recording Arts and Sciences of the United States to "honor artistic achievement, technical proficiency and overall excellence in the recording industry, without regard to album sales or chart position". The Grammy Award for Best Blues Album was an award presented at the Grammy Awards, a ceremony that was established in 1958 and originally called the Gramophone Awards, to recording artists for releasing albums in the blues genre. Honors in several categories are presented at the ceremony annually by the National Academy of Recording Arts and Sciences of the United States to "honor artistic achievement, technical proficiency and overall excellence in the recording industry, without regard to album sales or chart position". The Grammy Award for Best Contemporary Christian Music Album is an honor presented at the Grammy Awards, a ceremony that was established in 1958 and originally called the Gramophone Awards, to recording artists for quality albums in the Contemporary Christian Music (CCM) genre. Honors in several categories are presented at the ceremony annually by the National Academy of Recording Arts and Sciences of the United States to "honor artistic achievement, technical proficiency and overall excellence in the recording industry, without regard to album sales or chart position". The Grammy Award for Best Gospel Album is an honor presented at the Grammy Awards, a ceremony that was established in 1958 and originally called the Gramophone Awards, to recording artists for quality albums in the Gospel music genre. Honors in several categories are presented at the ceremony annually by the National Academy of Recording Arts and Sciences of the United States to "honor artistic achievement, technical proficiency and overall excellence in the recording industry, without regard to album sales or chart position". The Latin Grammy Award for Best Contemporary Pop Vocal Album is an award presented by the Latin Academy of Recording Arts & Sciences. It began to be presented at the 2012 ceremony. The awards replaced the previous awards for Best Female Pop Vocal Album, Best Male Pop Vocal Album and Best Pop Album by a Duo or Group with Vocals. The Juno Award for Contemporary Roots Album of the Year is presented annually at Canada's Juno Awards to honour the best album of the year in the contemporary roots and folk genre. Prior to 2016, awards for this genre were awarded in two categories: Roots & Traditional - Solo and Roots & Traditional - Group. Beginning with the 2016 ceremony, the solo and group categories were replaced with contemporary and traditional roots categories, to "ensure two genres of music are not competing against each other in the same category".